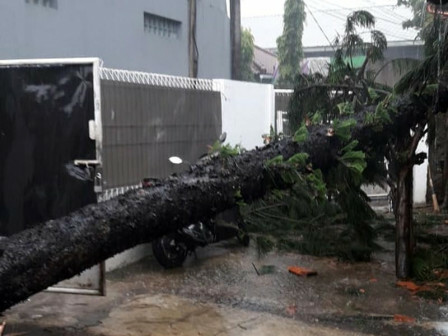 " We immediately evacuate the tree after receiving the fallen tree report"
Due to heavy rain and strong wind, a 25-meter-long pine tree fell on Jalan Raya Perintis, Gg. Apel, RT 06/05, Ceger, Cipayung, Sunday (11/11) afternoon. Unfortunately, the tree hit one of citizen's houses. East Jakarta Fire and Rescue Sub-dept. 's Fire and Rescue Section Head, Gator Sulaeman stated that there were fatalities and casualties reportd in the field. Aside that, the house owner suffered material losses of around Rp 15 million. "We immediately evacuate the tree after receiving the fallen tree report," he expressed.